Chinese President Xi Jinping has warned Taiwan that it would face the “punishment of history” if it moves to split from China. Xi made the comments in a speech to about 3,000 delegates at the end of the National People’s Congress legislative meeting in Beijing. However, Xi’s warning to the self-ruling island was the strongest yet and received the most applause of any part of the speech. China claims Taiwan, a self-ruling island of 24 million people, as part of its territory. The division came when the government of the Republic of China went to Taiwan in 1949 ending China’s civil war. The Chinese Communist Party took control of the mainland. By the 1980s, Taiwan’s government had become increasingly democratic. Most Taiwanese oppose unifying with mainland China. Xi has increased pressure on Taiwan since the election of Taiwanese President Tsai Ing-wen in 2016. Tsai is a member of the Democratic Progressive Party which supports independence from the mainland. 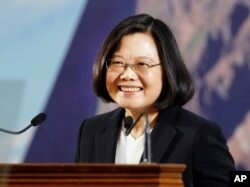 However, Tsai has said she supports the status quo and has not sought a major change of policy. Taiwan’s foreign ministry spokesman Andrew Lee said he was not concerned about Xi’s comments and called on other countries to support Taiwan. Lee said the island hopes to play a more active part in supporting “peace, stability and prosperity” in the area. The U.S. officially cut ties with Taiwan in 1979 when it recognized China. Unofficial ties were then governed by the Taiwan Relations Act that was passed the same year. Last week, United States President Donald Trump signed the Taiwan Travel Act law passed by Congress. The legislation is meant to make it easier for U.S. officials to travel to the island and meet with Taiwanese officials. As part of that effort, a top U.S. State Department official is traveling to Taiwan. Alex Wong is deputy assistant secretary of state for East Asian and Pacific Affairs. He is to be in Taiwan until March 22 after meetings in Singapore. 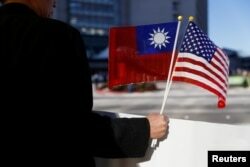 FILE - A demonstrator holds flags of Taiwan and the United States in support of Taiwanese President Tsai Ing-wen during an stopover after her visit to Latin America in Burlingame, Calif., Jan. 14, 2017. Wong is expected to speak at a dinner of the American Chamber of Commerce. The event is meant to help American businesses meet with Taiwanese officials. The Taiwan Travel Act states that ties between the U.S. and Taiwan have suffered because of self-imposed U.S. restrictions. China, however, has reacted angrily to the new legislation. Foreign ministry spokesperson Lu Kang urged the U.S.: “To correct its mistake, stop pursuing any official ties with Taiwan or improving its current relations with Taiwan in any substantive way. However, it remains to be seen how the Chinese president will answer the recent developments. Earlier this month, the Chinese government announced 31 measures that make it easier for Taiwanese to work, study and invest in China. Bill Ide and Nike Ching reported this story for VOA News. Mario Ritter adapted it for VOA Learning English. Hai Do was the editor.